Whatever you do, when opening Terminal and running ‘java -version’, you should see something like this, with a version of at least 1.8.x I.e. Tomcat 9.x requires Java 8 or later. Download a binary distribution of the core module: apache-tomcat-9.0.13 from here. I picked the tar.gz in Binary Distributions / Core section. you may also want to check out Activata’s Tomcat Controller, or here a tiny freeware app, providing a UI to quickly start/stop Tomcat. 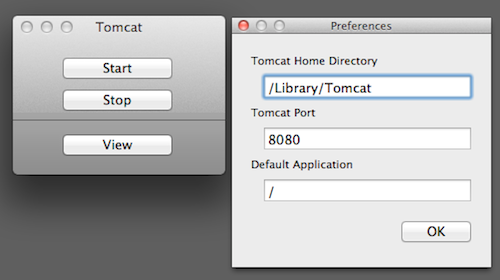 It may not say so, but Tomcat Controller works on macOS 10.14 just fine. Nice tuto, one short question: I run a macOS Server 5.2 on 10.11.x and plan to install alfresco community installer on it, beside of Port Changes, any recommendations ? Should work side by side or may apache issues ? Thanks Wolf. This is exactly what I needed at exactly the right time. I will let you know how it goes and any thing I might add to your instructions set. I doubt that I’ll need to do that tho. Thank you, was exactly what I needed! Nice tip with the “Activata’s Tomcat Controller”. Thanks a lot, Wolf. I had some issues with new mac os sierra and now it works like a magic. Very Nice Tutorial. Saved my day. It’s working well. username / password for app manager? Awesome post, worked like a charm. Thanks Wolf! Nice and short, served my purpose, Thanks! Did anyone notice the error message in /logs/catalina.out ?? 2The XML schema [ lots of files ] could not be found. This is very likely to break XML validation if XML validation is enabled. Great tutorial, thank you very much! I just moved Tomcat into my Documents folder for now so I could mess with it there without going through terminal for certain configs (makes it easier with Brackets as a text editor). Simple and effective, thanks mate. Working on High Sierra as well. 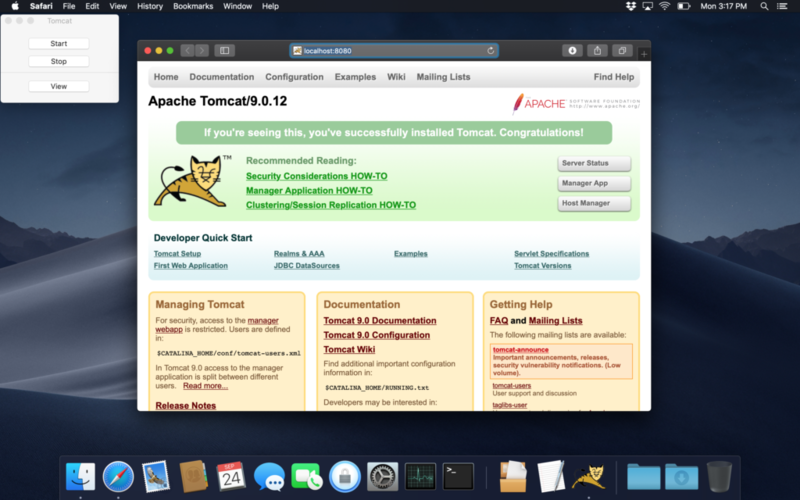 Thanks very much for the excellent guide to install Tomcat on Mac, its very easy to follow and effective. Thanks a lot! Simple and smooth. Many thanks, I was having difficulties getting Tomcat to run on OSX 10.13, until I found this! Great instructions. Worked first time. Having awful problems with my site after Mojave update so hoping this is the first step to getting it all back on line. Its not up yet!! I ended up installing the free Abyss Web Server software instead of Tomcat. Unbelievably easy and totally reliable. There is also a paid version which allows you to run multiple sites and aliases etc as well as HTTP and HTTPS. I just use the one website on https so no issues for me there and pointless upgrading until I feel the need to diversify. I would recommend this software 100% for hobbyists. /Library/Tomcat/bin/catalina.sh: line 464: /System/Library/Frameworks/JavaVM.framework/Versions/Current/bin/java: No such file or directory. I’m stumped as to how to change it, in setclasspath.sh? Not the easiest script to edit. Same problem. startup.sh failed (localhost:8080 not found). But starting Tomcat with ./Catalina.sh run did start Tomcat. Then there is the question of how to start Tomcat with a launchd *.plist LaunchDaemon. Now if I can just get the launchd tomcat*.plist to load on reboot…. Great instructions, thanks! Also works nicely on High Sierra. Has anyone managed to create a launchd plist item for Tomcat 9? # This is required to interact with launchd correctly. # Wait here until we receive a signal that tells Tomcat to stop..